Arkansas will host Fan Day presented by Pepsi at Donald W. Reynolds Razorback Stadium on August 25. 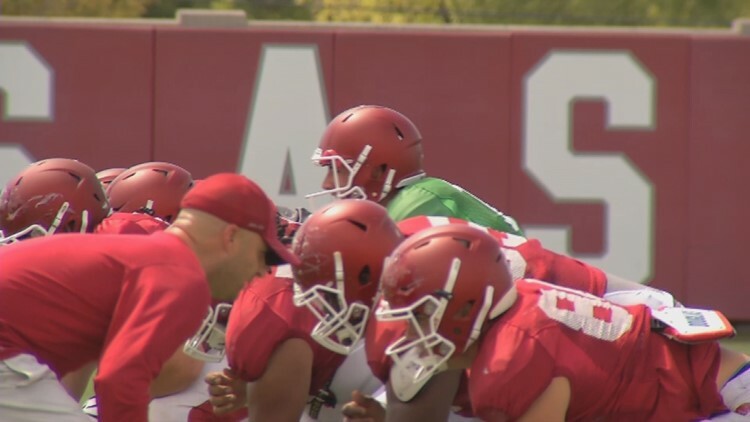 The free event will be held from 6-8 p.m.
Arkansas hosting 'Fan Day' Aug. 25 — FAYETTEVILLE, Ark. -- Arkansas will host Fan Day presented by Pepsi at Donald W. Reynolds Razorback Stadium on August 25. The free event will be held from 6-8 p.m.
Head coach Chad Morris and the Razorbacks will sign autographs on the concourse and on the field with interactive entertainment throughout the stadium. Fans will also have their first chance to pick up a new 2018 Razorback Football poster. In order to expedite the autograph process and accommodate as many fans as possible, Coach Morris and players will autograph one item per person. The kids’ zone on the field will feature inflatables with more activities on the concourse, including a photo booth, face painting, caricature sketches and balloon art. The Razorback Spirit Squads and Tusk will also be in the house to greet fans. Free parking is available in lots 46, 56, 56B, 60, 72, 73, 73A and 74 along with the Stadium Drive parking deck and Meadow Street parking garage. Fans can enter the stadium via gates 1, 14 and 16 beginning at 6 p.m. Members of the Junior Razorbacks will be allowed to enter at 5:45 p.m. at Gate 15S on the east side of the stadium. Concessions will be available for purchase on the concourse. Only bottled water will be allowed into the stadium with no other outside food or drinks allowed. Hog Heaven will be open on the south concourse during the event with footballs, mini helmets, hats and other items available for sale for autographs.